The passion of a home cook meets the spirit of revolution! Sadrah and Mike channeled their punk rock ethos and hunger for the most boss plant-based proteins into creating No Evil Foods. With true DIY resourcefulness, they harnessed traditional methods to make real meat using nothin’ but plants. Throwing caution to the wind and with a thirst for adventure, No Evil Foods was built from the ground up, giving life to a powerful mission: to use food as a force for good, because real change starts at the center of your plate. 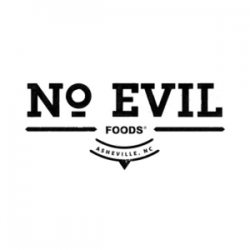 From our humble beginnings at one farmer's market in Asheville, NC, No Evil Foods has rapidly exploded into over 300 grocers across more than 25 states. Today, four core products provide delicious, texture-rich protein for the center of every plate and at every meal. With increasing public awareness of the value of a plant-based diet, 2017 propelled NEF to revenue double that of 2016. Participation in our first national food show brought greater attention to the brand and we were called out for “approaching the category in a really fresh and exciting way.” We also won a coveted award for our new compostable packaging! Consumers, retailers, and brokers have come calling, adding their voices to an already strong core of passionate followers. No Evil Foods is uniquely positioned to challenge other meat alternative brands with our alarmingly delicious, artisanal products!